Previously, the small ring templates were only accessible from the main command bank, and mixed in with a diverse variety of more sophisticated ring blocks, functional groups, building blocks, etc. Adding the most commonly used rings to the context button-bank makes a lot of drawing operations more convenient. Afterall, each time you need to tap the screen, some valuable fraction of a second of your life is gone forever, and we software designers have a moral duty to make sure that this happens as infrequently as possible. Previously the rendering style was determined by the current setting from within the app, which is not necessarily what you want when sending out content. This is a nice convenience feature, but notice that there is a 5th option: Printed Publication. 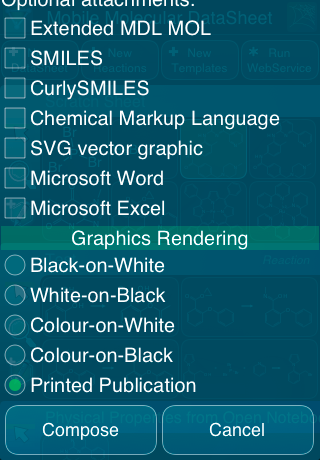 This is a collection of preset rendering specifications that matches the ACS style guide for chemical diagrams. It also informs the creation of raster graphics (i.e. bitmaps) that the width x height of the resulting image should be sufficient to achieve a 600 dpi resolution, which is for all practical purposes the minimum necessary to make sure that bitmaps look good when printed. While the vector graphics output options (SVG, Microsoft Word & Excel) make use of the remote molsync.com server to render the output, and raster graphics (PNG) are normally created by the device itself, there is a slight-of-hand at work here: when the Printed Publication rendering mode is selected, PNG files are also rendered by the remote server, instead of the device. This is in order to take advantage of some recent technological improvements on the server, which results in higher quality output. This subject will be discussed in more detail in subsequent posts, so stay tuned.